With Rockwell Group’s newly opened Dream Hollywood Hotel and its five nightclubs and restaurants spread across an entire city block, partner Shawn Sullivan likes to think of the complex as an “urban resort.” Between the Highlight Room, Beauty & Essex, and Avenue lounges; TAO Asian Bistro; and Luchini Pizzeria & Bar, he says, “It really feels like a new immersive playground for the city that invites both guests and locals to stay and linger; you can just move from one venue to the next.” It’s an unexpected perk in a city where parking and traffic are endless struggles. Some of these venues opened earlier iterations in New York, and have now been translated for an L.A. sensibility. Whereas the New York versions span the Lower East Side to the Meatpacking District to Midtown, linked by subway lines and taxicabs, they’ve been condensed in L.A. into a single-destination complex centered on a slate alleyway wedged between brick buildings, an homage to New York City’s pedestrian-oriented experience. “The public esplanade allows us to accommodate multiple drop-offs and walk-ups, and not congest the streets,” says Sullivan. And in response to L.A.’s climate (and undoubtedly its earlier last call of 2:00 a.m.), the venues have been modified to take greater advantage of sunlight. Each space is equipped with flexible features that allow both daytime and nighttime uses: sliding doors, terraces, and fully operable windows. In an update from its older New York counterpart, Hollywood’s Avenue nightclub contains a fixed translucent roof courtyard with a fully retractable center and easily movable furniture and plants, so that the dance floor can double as a banquet space during the day. And in the Highlight Room, the motorized pool floor can rise to the level of the pool deck, increasing the square footage of dry floor space whenever needed. 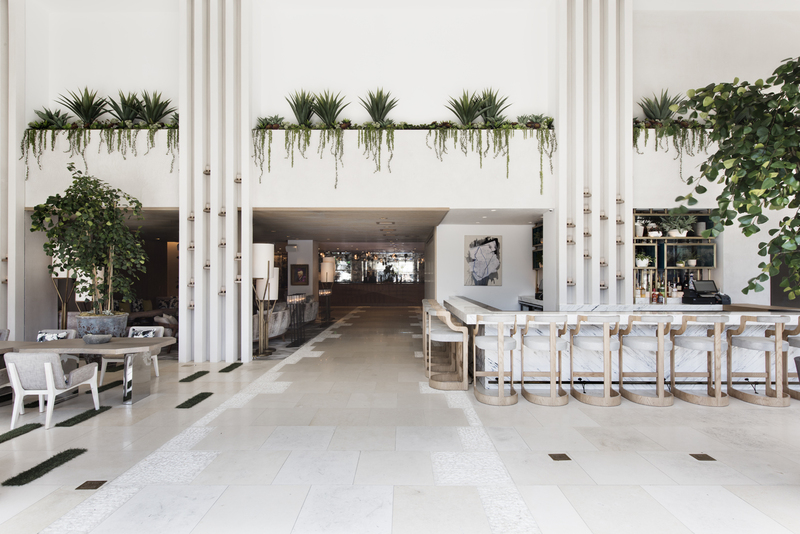 The Dream hotel itself reflects L.A.’s Modernist indoor-outdoor legacy with floor-to-ceiling operable glass in the lobby, where the airy double-height foyer brims with plants and patches of real grass growing between the white-stone floor tiles. Upstairs in the 178 guest rooms, Modernist wooden furniture commingles with abstract art dotting the walls. In some of the rooms, if you squint, you can make out the pattern of headlights lined bumper to bumper along the 405—perhaps the most quintessentially L.A. feature of all.